As its name so bluntly implies, R.C. Pro-Am II is the sequel to Rare’s R.C. Pro-Am. Once again, the game is an isometric racer, in which players take control of remote controlled cars and use weapons and items during races. Though R.C. Pro-Am II makes some improvements over its predecessor – including the addition of multiplayer – it also suffers from same of the same shortcomings which, when considering this sequel was released four whole years after the original, is kind of hard to look past. The core gameplay, for better and worse, is nearly identical to its predecessor. The cars still control surprisingly accurately to remote controlled toys, which is an interesting quirk, but can make some of the gameplay a little frustrating. You still race three other cars, and can still pick up missiles, bombs and shields to aide you in your races. But there are some new twists this time around. For starters, multiplayer has been added to the experience. This is definitely the game’s greatest contribution to the formula, as it was something the first game was just begging for, but lacked. All the better is that this was one of the few NES games to be played with up to four players! Though getting four people the chance to play at once was certainly a complicated task back in the NES days, the Rare Replay version makes the four-player mayhem far more accessible. Another difference between this game and the original R.C. Pro-Am is that you no longer pick up weapons and items on the racetrack. Instead, you pick up money during the races, and then purchase upgrades to your car and weapons in between races. Now, this setup certainly is unique, and in concept I don’t dislike it. But in execution, it has its flaws. For starters, many of the items are just far too expensive. Sure, you can save up money from race to race, but if you want to get any of the good items, you’ll have to go several races without buying anything, which will leave your car slow and defenseless in that duration. But if you buy smaller items as you go, you’ll probably use them up in one or two races (most likely missing your targets due to the controls anyway), and then you won’t be able to afford the fancier stuff. At the very least, they could have made it so you can pick up the traditional items on the tracks, and then use the money for the vehicle upgrades. What makes this all the worse is that the computer opponents can take the money during races. Now, I suspect this is due to that the other cars could potentially be other players, but couldn’t they have programmed it to differentiate when the other cars are players and when they’re AI, so that the computer can’t take away the player’s potential currency (which, as far as I know, the CPU doesn’t use)? 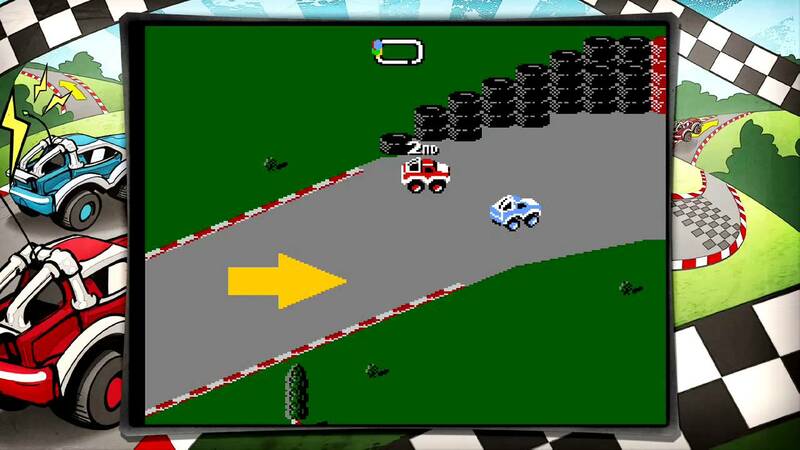 The AI can even pick up 1-ups from the racetrack, preventing you from gaining a potential continue. Another bit of a downer is that you have no control over what tracks you’re racing on. You simply go through the courses in order, with no alternative modes providing a level select of any kind. Sure, it was the same way in the first game, but that was 1988. R.C. Pro-Am II was released in 1992. You’d think by this point they could have expanded things a little bit. This brings me to another downside to the game. Despite the four-year gap in between releases, R.C. Pro-Am II uses the same graphics and sounds as its predecessor. Now, as far as NES titles go, R.C. Pro-Am was already pretty colorful and had some catchy music, so it’s not that the aesthetics are bad. But again, with the extended timeframe between the original and this sequel, you’d think a few things could have been touched up. The Super Nintendo was out by this point, and Super Mario Kart was released the very same year as this title. When you take that into consideration, it really makes R.C. Pro-Am II feel like it didn’t give the effort it could have. This may all sound very negative, but I will stretch that the core gameplay is still fun, and the fact that this entry actually has multiplayer – and for up to four people – helps keep it afloat even with its design flaws and recycled elements. Sure, you’d be better off playing Super Mario Kart with a buddy, but if you want to try out some four-player NES mayhem (even if it’s on Xbox One), R.C. Pro-Am II is far from a lost cause. I never thought about it, but I guess this game and its predecessor were my first racing games (other than the full seat, steering wheel, and pedal arcade set ups). I remember the music and sounds standing out, and also how frustrating the game was. I never could quite get the controls right to advance very far. Now I just stick to Gran Turismo.